Vanaire is a world-leading designer and manufacturer of Acid Scrubbers for industrial and manufacturing facilities that face the challenge of capturing and containing sulfur dioxide or ammonia in manufacturing processes, which can cause serious damage to equipment and lead to health problems in workers. Vanaire Acid Scrubbers are designed to effectively remove Hazardous Air Pollutants (HAPs) by injecting liquid into the gas stream. Our Acid Scrubbers are made from solid, corrosion-resistant materials to ensure long-lasting and safe performance. • Vanaire engineers implement high-flow liquid recirculation to provide excellent removal of emissions produced contaminated hydrochloric and hydrofluoric acids. Used in industries such as surface and metal finishing, pharmaceutical production, and chemical processing, these toxic agents can cause serious corrosion on manufacturing equipment and pose severe health risks. • Vanaire Acid Scrubbers are also perfect for the food manufacturing, iron and steel production, and coal industries. We manufacture highly efficient Wet Scrubbers that can remove sulfuric acid emissions from the air. 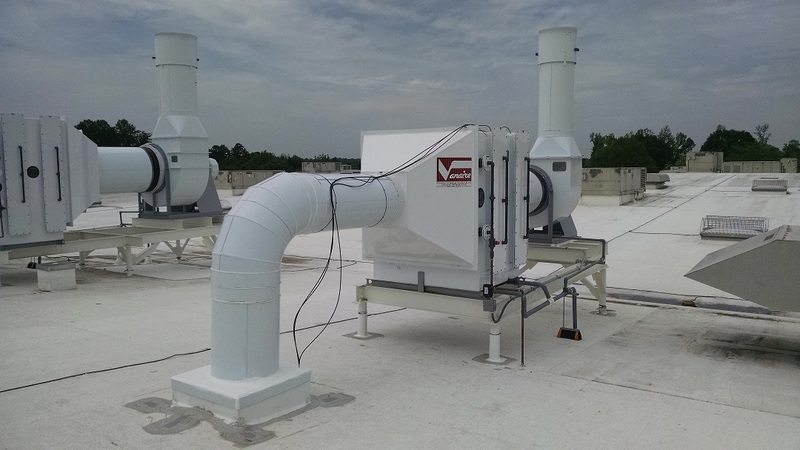 • Enterprises that handle anodizing processes and chromic plating can turn to our line of Vanaire Acid Scrubbers designed to remove chrome gases from the air. • Vanaire Acid Scrubbers are ideal for enterprises in the nickel/copper smelting and refining industry. Vanaire Ni/Cu industrial air scrubbers offer outstanding removal rates of copper-based contaminants from the air. Contact the Vanaire team today to learn more about our complete line of Acid Scrubbers.